Image taken via afocal method (Panasonic Lumix DMC-FH2 digital camera on Galileoscope). October’s Full Hunter’s Moon nearly coincides with the apogee of the moon’s orbit, or the point at which the moon is farthest from Earth. That makes October’s full moon appear smaller than usual, the opposite of the “supermoon” effect that occurred earlier last March when the moon was full during its closest approach to Earth. 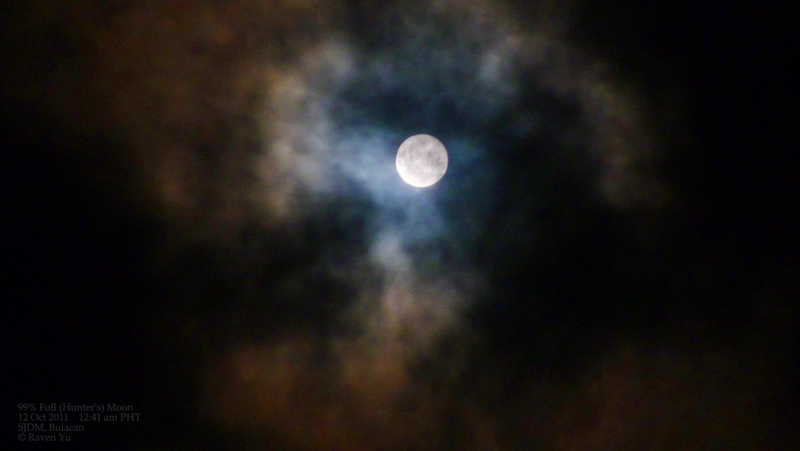 October’s (almost full) Hunter’s Moon surrounded by thick gray clouds. 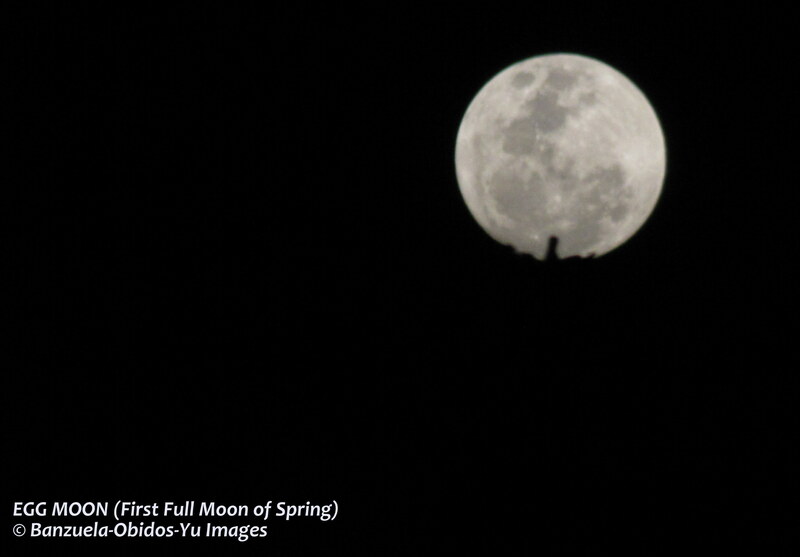 This was the smallest, farthest full moon in 2011. 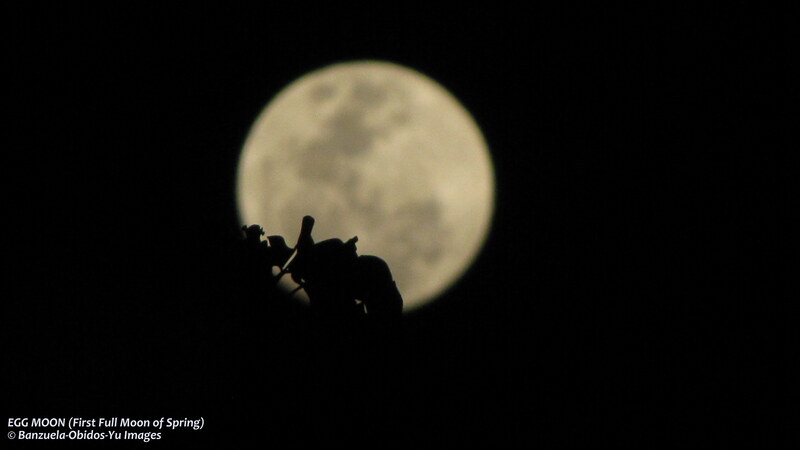 The moon reached its peak fullness at 2:06 a.m. UT last Oct. 12. Shortly thereafter, the moon was at its farthest point from Earth, which it reaches once a month. The moon’s orbit is elliptical rather than perfectly circular, which is why the distance from Earth to the moon varies by tens of thousands of miles depending on the time of month and year. The moon’s orbit is also always slightly changing because of differing effects of the sun’s gravity. Though we couldn’t notice with our own eyes, the Moon’s apparent size changes throughout the year and this is because of the phenomenon called Lunar libration, or the wobbling of the Moon. Below is an animation which demonstrates this effect. It shows the geocentric phase, libration, position angle of the axis, and apparent diameter of the Moon throughout the year 2011, at hourly intervals. 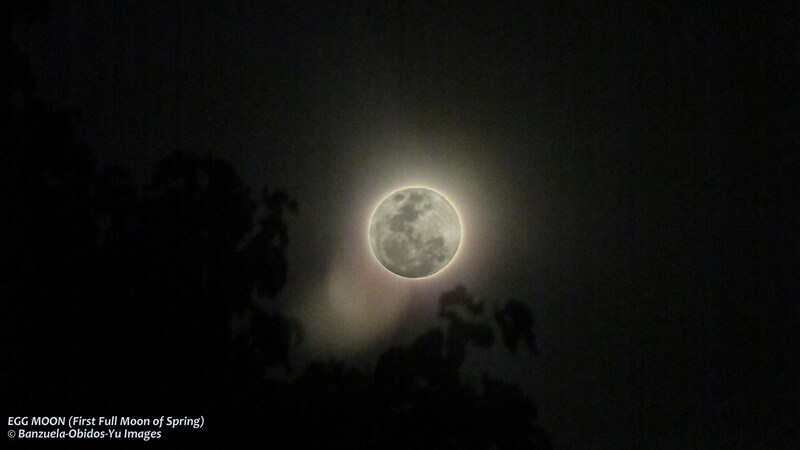 It was cloudy throughout the week of the full moon last month. But that didn’t stop me and my friend Bea Banzuela, from taking images of our nearest neighbor in space during its full phase. The following were taken last May 16 and 17, 2011 using Panasonic Lumix Digital Camera. 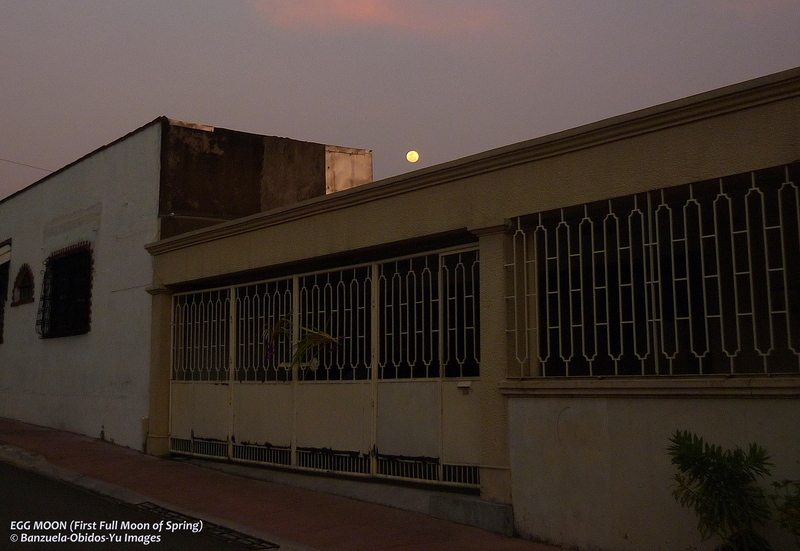 Spring’s First Full Moon Along Galaxy Street! 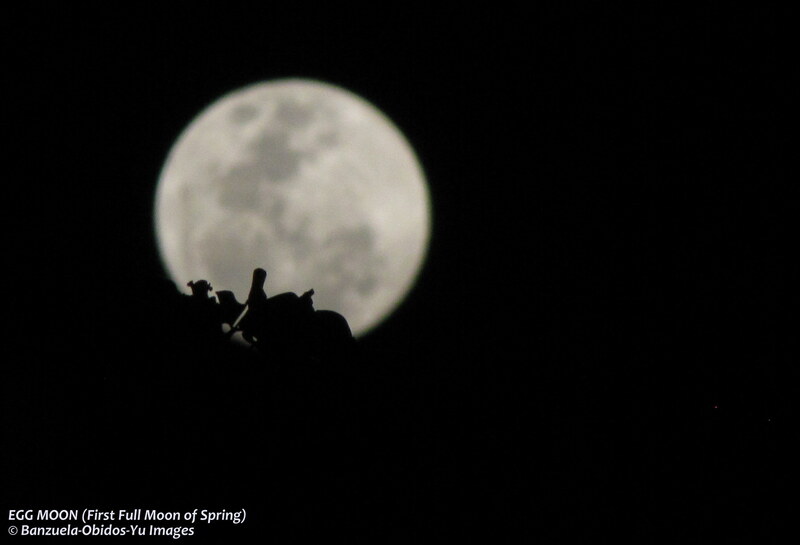 April’s Moon reached its full phase last April18 at 10:45 AM PST (2:45 AM UT). 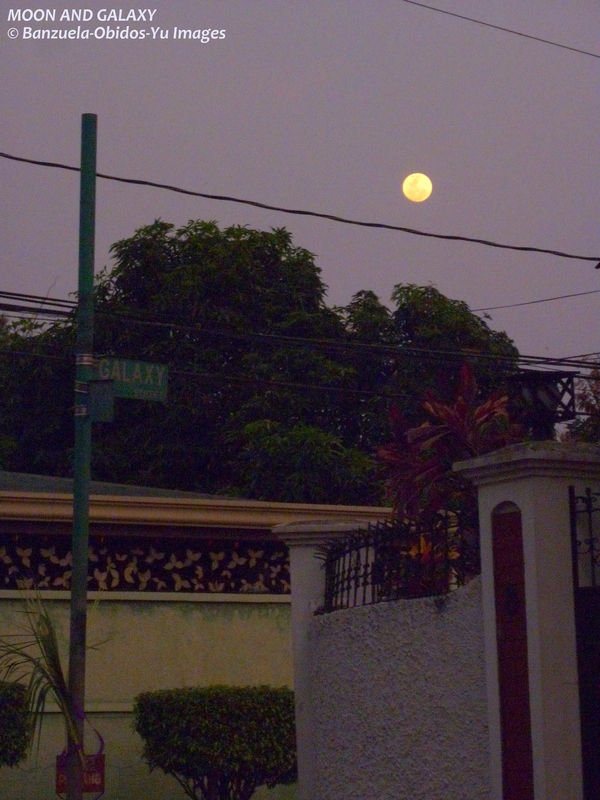 During Palm Sunday in the Philippines last April 17, 2011, I and some friends spotted the 99.5% full Moon rising at dusk. 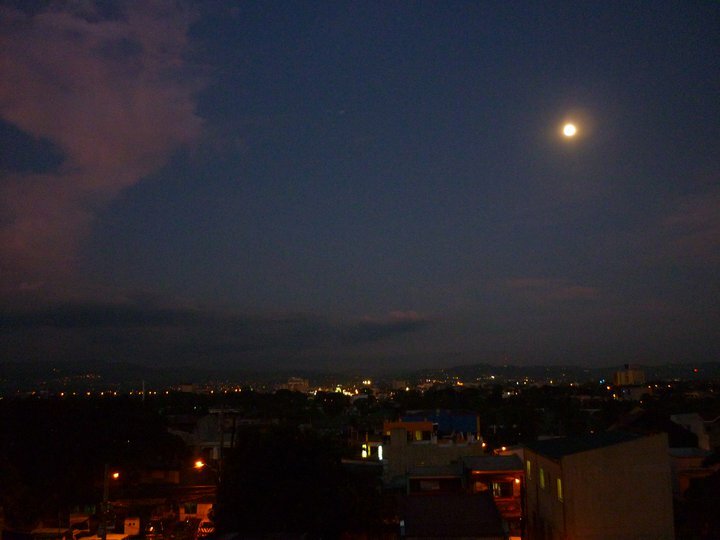 It looked like a big ball of cheese hanging up in the sky along a street named Galaxy Street in Panorama, Marikina City. It seemed larger near the horizon during moonrise than it does while higher up in the sky. 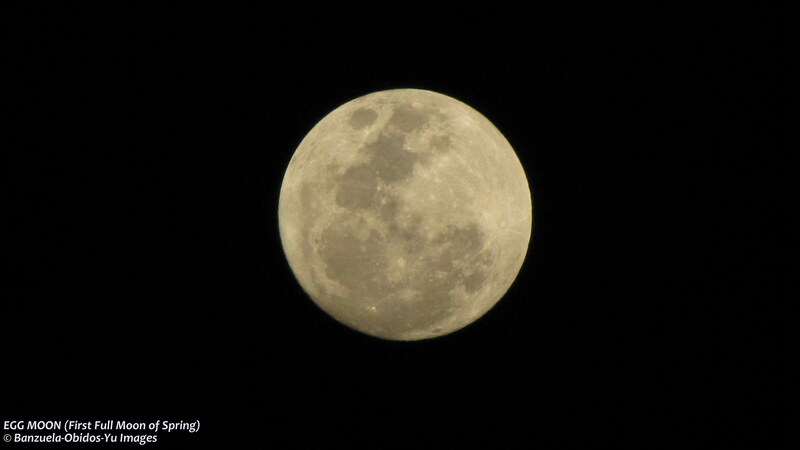 According to EarthSky.org, this is the first full moon of springtime for the northern hemisphere. 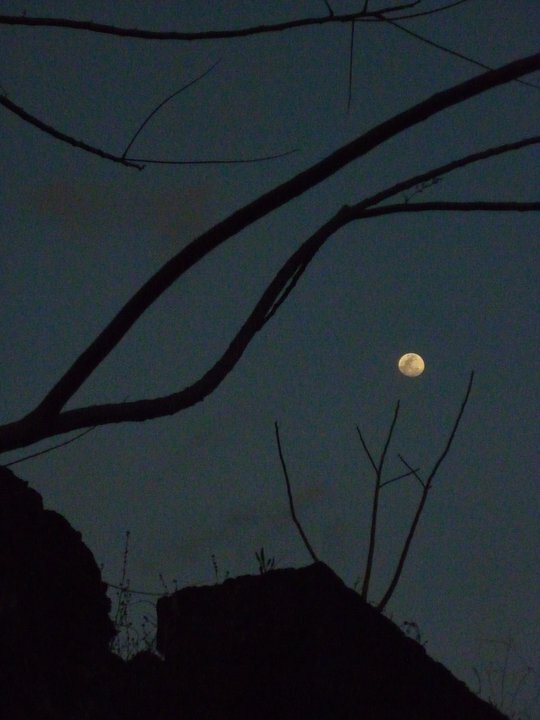 We in this hemisphere call it the Pink Moon, to celebrate the return of certain wild flowers. Other names are Egg Moon, Sprouting Grass Moon, or Easter Moon. 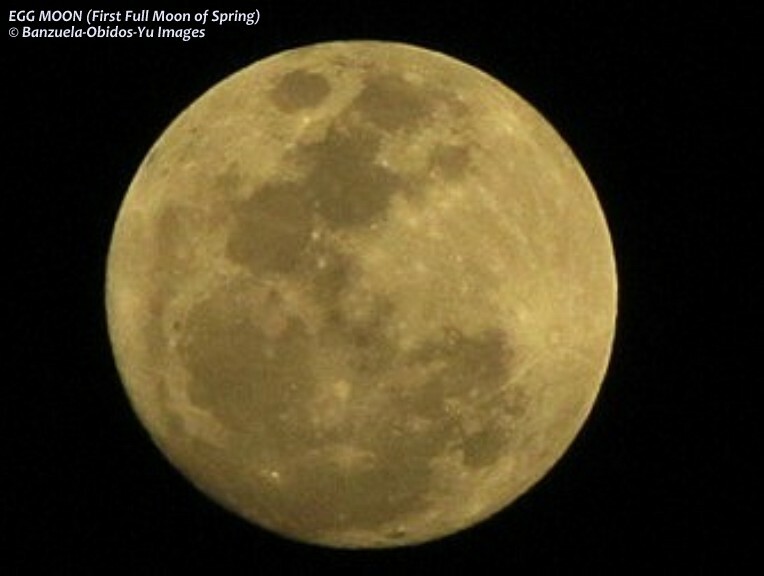 The first Full Moon of spring is also usually designated as the Paschal Full Moon or the Paschal Term. In most years, the Christian celebration of Easter is observed on the Sunday after the Paschal Full Moon. 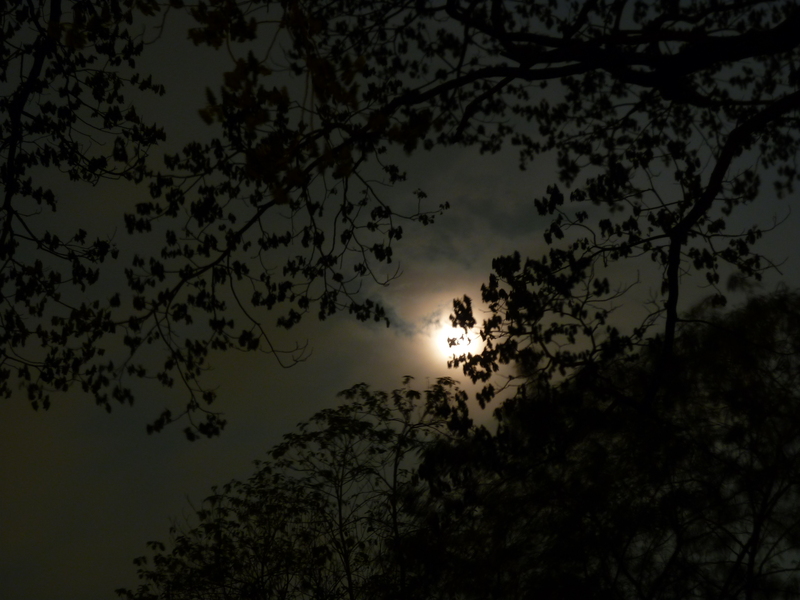 If the Paschal Moon occurs on a Sunday, Easter is the following Sunday. 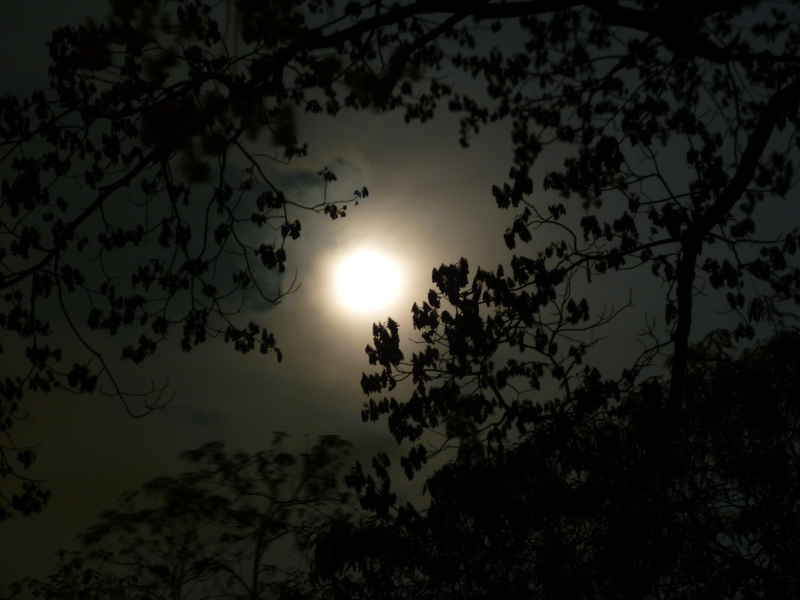 For those living in the Southern Hemisphere, the autumn counterpart of the Paschal Full Moon is called Harvest Moon, the closest full moon to the autumnal equinox. What sets the Harvest Moon apart from the others is that instead of rising at its normal average of 50 minutes later each day, it seems to rise at nearly the same time for several nights. However, in direct contrast to the Harvest Full Moon, the Paschal Full Moon appears to rise considerably later each night. 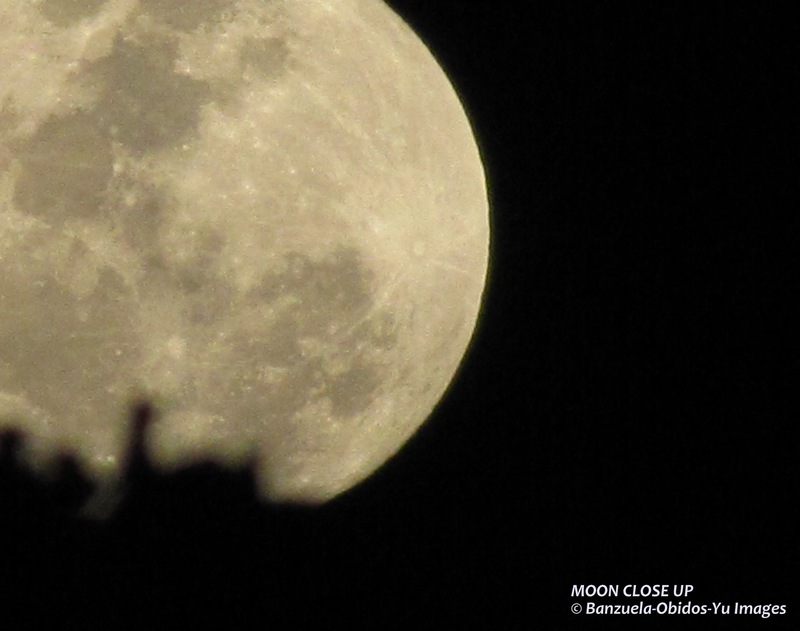 Here are the other photos taken by me and two of my fellow UP AstroSoc folks, Andre Obidos and Bea Banzuela. 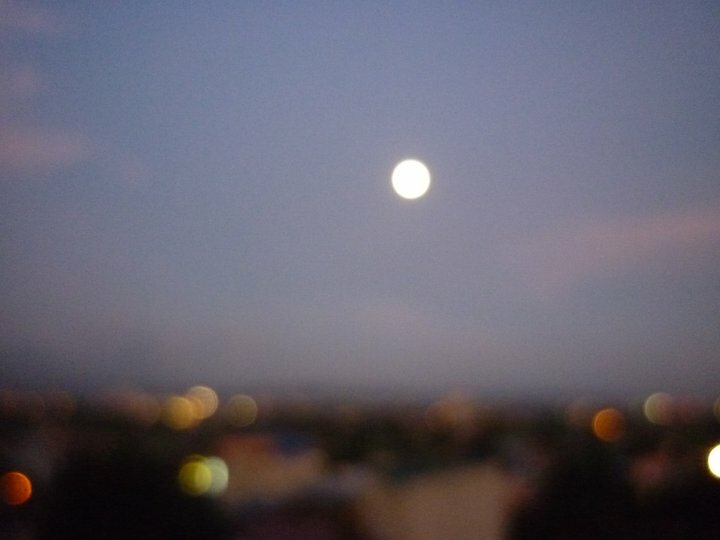 A combination of the overexposed (1/8 sec exp., ISO-1600) and underexposed (1/320 sec. 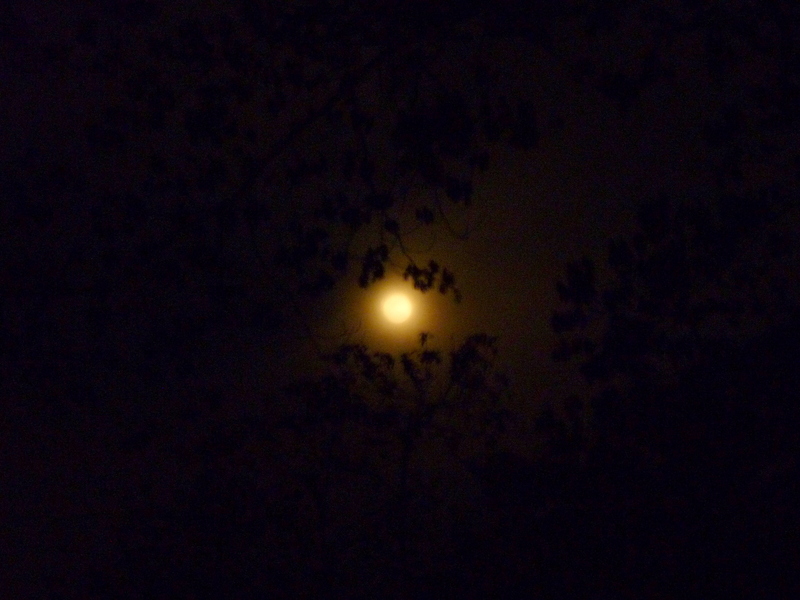 exp., ISO-400) photo of the Moon. All images can be clicked to see high-res versions. Amazed by the remarkable beauty of the Moon hanging on a perfect indigo sky one afternoon, I immediately set up the tripod and grabbed my trusty Kodak C813 8.0 megapixel digital camera to capture the view. My camera is not suitable for taking images of distant objects such as the Moon especially during low light conditions. Nevertheless, I still tried my luck in getting a few relatively decent shots. Moon and the Avocados! (left) Camera setting: Flash was fired. 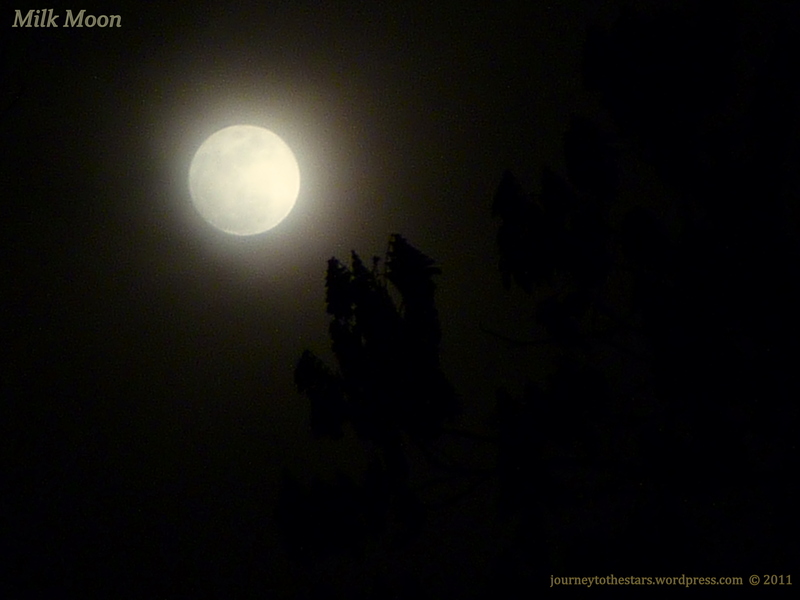 This 40% illuminated Moon was in the constellation Gemini during this apparition. While checking on the images, I saw that a star was visible on the upper left of the Moon — about 10 degrees away from it. After running Stellarium, I realized that it was the 1.93 magnitude star Alhena (or Gamma Geminorum) that is located on the left foot of the Twin Pollux. 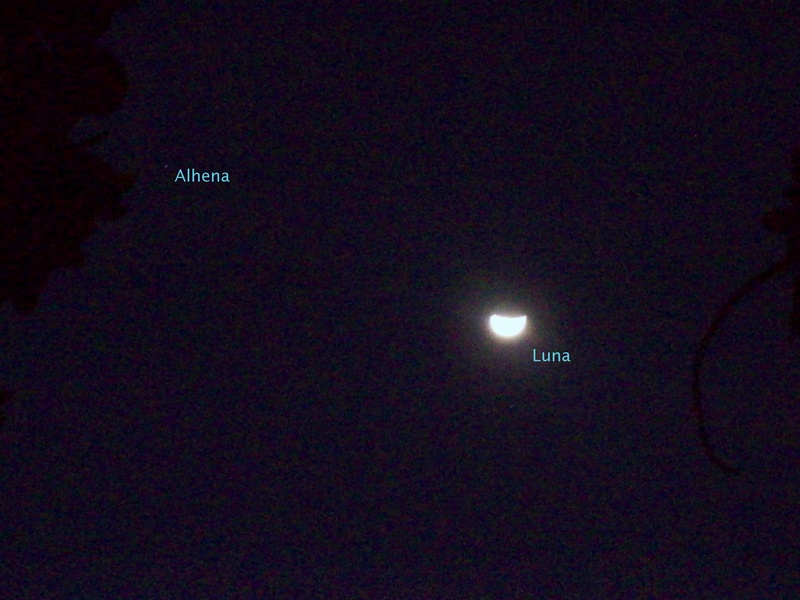 Alhena and Luna (click to enlarge). 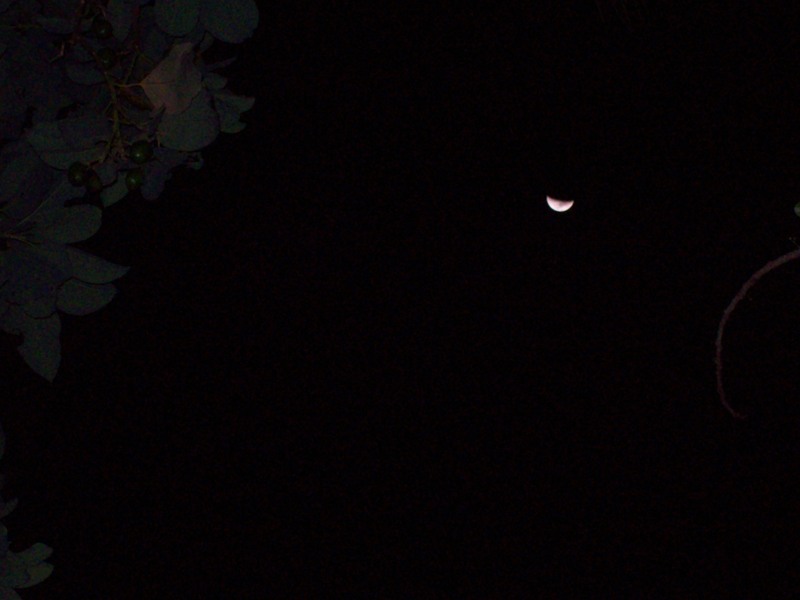 Notice also the faint earthshine on the Moon's disk. I really need a camera upgrade I guess. 🙂 Haha! It feels great whenever there’s great opportunity like this to take photos of the night sky. 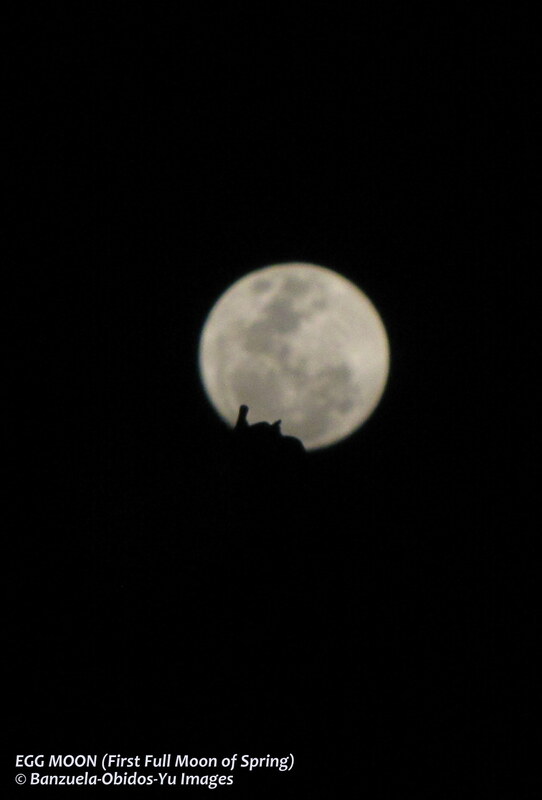 Anyway, with or without pictures the Moon has really never failed to amuse me. This is my first ever humble attempt to create a lunar montage 😀 *Please forgive my lack of skill in image processing. I’m still working on it. * Haha! 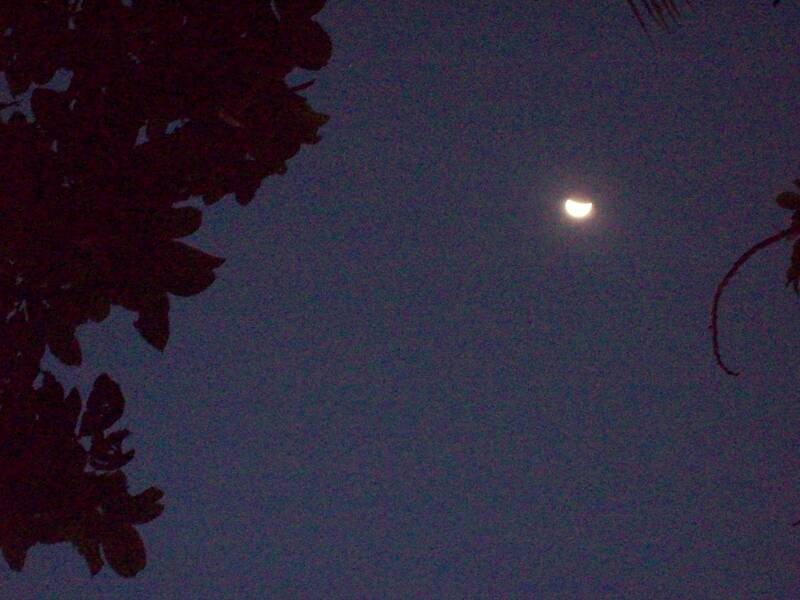 The Moon phases were from March 1 (waxing crescent, topmost right) up to March 29 (waning crescent, bottom right). 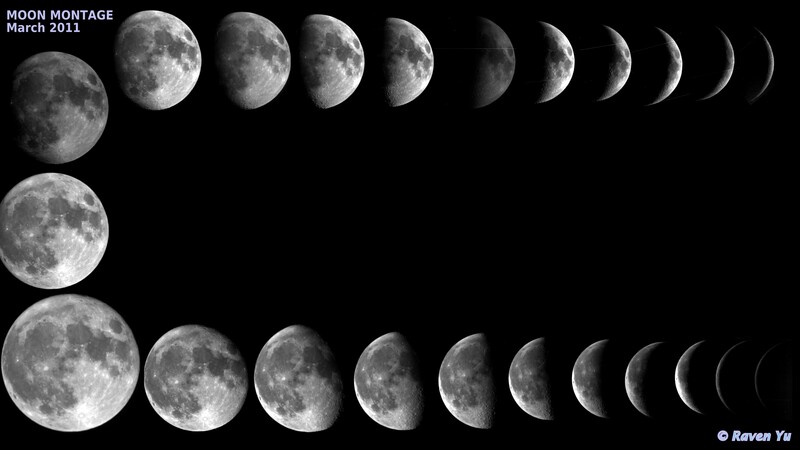 All photos converge to the Perigree Moon (or Super Full Moon) of last March 19, 2011 which was at the lowermost left. 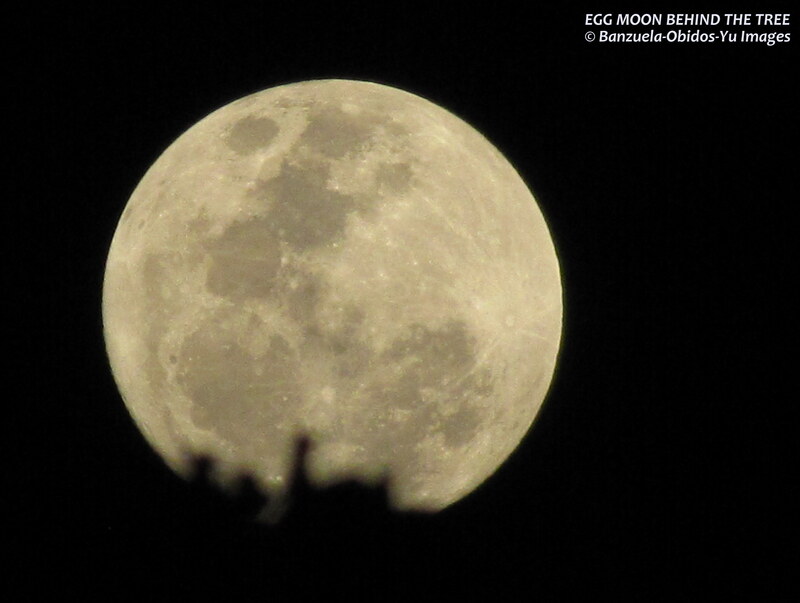 During its full phase, the Supermoon is roughly 34 arc minutes (~0.6 degrees) and is about 357,000km close to Earth. Please take note that no images were taken during March 2, 4, 5 and 6 because of the thick cloud cover during those days. I used MS Office Picture Manager to edit the individual photos and Picasa 3 to compose the montage. Images taken using MicroObservatory Online Telescopes. MicroObservatory is a network of five automated telescopes that can be controlled over the Internet.